Six years ago today, I started this blog. My first post was painful to write. But I was a little giddy when I finally hit publish. And even more giddy when I immediately got a comment from a stranger. Welcome to the blogging world, kid. My entry into this crazy, vast, amazing universe can be attributed to three blogs: Baby Bangs, Boo Mama and Big Mama. I found Amanda first; it was she who introduced me to the concept of a relational blog. I found Boo Mama next; it was Sophie who introduced me to the concept of college football. And then I found Big Mama; it was Melanie who introduced me to the snort-laugh. Of course, back in rugged 2007, we didn't know each other's first names. We were all still debating whether we should post pictures of our kids on the Internet. (The entire membership of Instagram just howled in laughter.) I still remember the shock and awe when both Boo and Big unveiled their real-life names on their blogs. It was surreal. I walked around for a week trying it on in my head. "Melanie. Sophie. Melanie. Sophie." We were weird back then, back at the very beginning of all things. Anyway. Because of these blogs, my daily habits started to shift. I ate my morning bowl of Kashi sitting in front of the laptop. I told my closest friend about the day-to-day antics of people I had never met. "And then Big Mama had to make Caroline a float for this thing called Fiesta..." I checked my bookmarked blogs a couple of times a day, just in case something new had been posted (this was before I knew about feeds), and I looked forward to Monday mornings so I could hear what happened on the weekends. I grew to love the camaraderie, the community that formed online. These women wrote about their everyday lives and made the mundane funny and meaningful. I had found my people. And I wanted to play. So on February 17, 2007, I jumped into the deep end, and my life was forever changed. You might have read on a few blogs that Big Mama just released her first book. Sparkly Green Earrings is so special to me. I remember being about ten years old and picking up a copy of Erma Bombeck’s book If Life Is A Bowl of Cherries Then What Am I Doing in the Pits? and reading it from cover to cover because I thought it was hilarious even though I had to be too young to understand some of it. And while I am no Erma Bombeck, I wanted to write a book that you could leave out on your coffee table and not be afraid for your ten year old to pick it up and start reading. In our culture of trashy commercials and other questionable things, that’s become a rarity. I wanted to write a book that will hopefully make you laugh and cry and feel a little less alone. And I howled with laughter at that, because I, too, read Erma Bombeck when I was a kid, and I didn't really get it but I knew it was funny stuff. Like, classic funny. Withstand the test of time funny. And Melanie has that gift too. I loved every minute of Sparkly Green Earrings. And I would like to take this opportunity to say thank you to Corey for putting up with me while I read this book in bed. It's hard to sleep when your wife is doing the whole-body, silent-shake, spaz-laugh next to you. I'm delighted to pass on the spazzing. 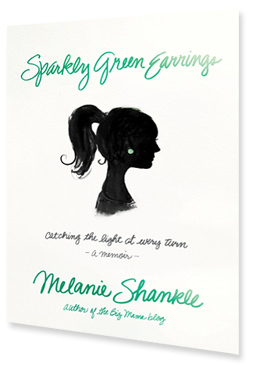 I have a copy of Sparkly Green Earrings to give to one reader. Just click the +1 option in the Rafflecopter widget below, and you'll earn yourself an entry. It's as easy as that. The giveaway will close at midnight on Friday, February 22. Erma Bombeck? Me too! In middle school, I had read all the children's lit in the house (hundreds of books, mind you) and my mom was at a loss. So she handed me the Erma Bombeck book she had been reading. Brilliant. I am so glad you started this blog- I feel like it fills in the time in between when we can see each other in person. Love you! That's pretty much EXACTLY how it went down for me too, Nicole. It's also how I read all the "how to parent a teenager" books before I was even a teenager. I love the Big Mama blog! I am such a blog stalker. I am CONVINCED that these people are already my friends. I always catch myself telling my husband a story somebody blogged about, and I always want to start with "So my friend _______." Only I don't actually know them in real life. Happy blogoversary, friend! So glad you decided to start and even more glad our paths have crossed. You are a gift! Right there with you! And I started in January of 2008. I missed my blogiversary this year. Can't believe I didn't throw a 5-year-party!! Well, to be fair Linda, I've never noticed any other year. Some years, my brain works more than others. I love it when favorite bloggers of mine turn out to know (either "really" or through the blogging world) other favorite bloggers of mine! Thanks for sharing the book, I'd love to read it. Don't you just love Amanda and those two precious babies! I always loved her blog! Thanks so much Kelly! I'me excited to win this book - can't wait to get into it!! !